Qualcomm Technologies is expanding its efforts with China’s growing ecosystem of leading automakers and suppliers to commercialize LTE Vehicle-to-Everything (LTE-V2X) direct communication technology based on 3GPP Release 14 specifications. 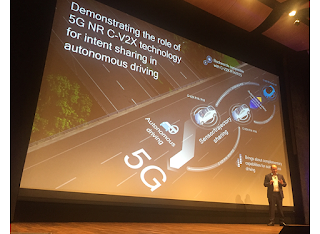 LTE-V2X, which is also known as C-V2X, is designed to support improved automotive safety, traffic efficiency, and automated driving using high performance and reliable real-time direct communication between vehicles, as well as with roadside infrastructure, and is on an evolution path supporting additional functionality as part of 5G New Radio (5G NR). Qualcomm Technologies is working alongside automakers including Audi China, BAIC, ChangAn, Geely and Great Wall and others, as well as China SAE ITS software stack providers Genvict, Nebula Link and Savari, Inc., to host China’s first large-scale multi-interoperability live demonstrations of LTE-V2X during the SAE China Congress Exhibition (SAECCE) event in Shanghai. Collectively, the seven V2V and V2I use cases that will be demonstrated include: Optimal Speed Advisory, Lane Change Alert / Blind Spot Alert, Emergency Brake Warning, Forward Collision Warning, Emergency Vehicle Warning, Intersection Collision Warning, and Slippery Road Alert. LTE-V2X PC5-based direct communication operates in the 5.9 GHz spectrum that the China government recently designated for LTE-V2X ITS applications and works independently of cellular operator network involvement. Through these demonstrations, China is well-positioned to demonstrate leadership in LTE-V2X with commercial readiness for RSUs, onboard units and vehicle integration in 2019. In addition, Qualcomm Technologies is working with Datang Telecom Group, a subsidiary of China Information and Communication Technologies Group Corp (CICT), to accelerate commercial deployment for LTE-V2X (also known as C-V2X across the globe) direct communication technology and applications based on 3GPP Release 14 specifications. The companies are collaborating on demonstrations at the SAE China Congress Exhibition (SAECCE) event held this week in Shanghai. The demos showcase Vehicle-to-Everything (V2X) and Vehicle-to-Infrastructure (V2I) use cases. In August, Qualcomm Technologies and Datang announced they had successfully completed the world’s first chipset interoperability test utilizing the Qualcomm 9150 C-V2X chipset solution and CICT’s LTE-V2X module, the DMD31.